Chris Haghirian has been writing about local music, playing local music on his radio show, and organizing an amazing festival in Kansas City for years. 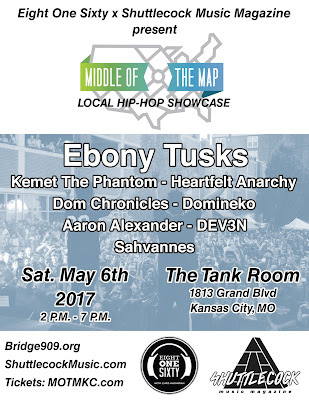 That's why Shuttlecock is excited to announce that we will be co-hosting a showcase at this year's Middle Of The Map Fest with Eight One Sixty (Haghirian's show on 90.9 The Bridge). 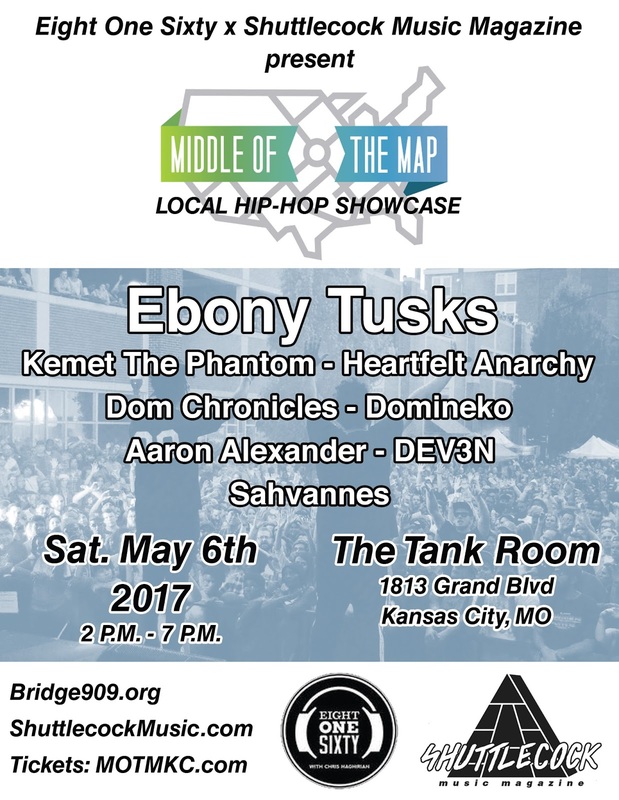 This show is all about putting Kansas City hip-hop artists in front as big of a crowd as we can manage. On Saturday, May 6th from 2 P.M. to 7 P.M., eight acts will take the stage at The Tank Room (1813 Grand Blvd. KCMO) for an exciting afternoon of performances. Catch sets from new blood and Shuttlecock favorites back-to-back with long-active Kansas City veterans. Performing at the show are: Ebony Tusks // Kemet The Phantom // Heartfelt Anarchy // Dom Chronicles // Domineko // Aaron Alexander // DEV3N // Sahvannes. Admission is included with 3-day passes to Middle Of The Map Fest and 1-day passes for Saturday. (Acts performing Saturday night after the showcase include De La Soul, Talib Kweli, Ro Ransom, and more). Tickets and a full lineup for the fest are available at www.MOTMKC.com. Shuttlecock will have photo zines, buttons, and a new piece of merchandise available first at this show. RSVP to the showcase on Facebook and invite your friends.